What’s in the NZCCSS Christmas Stocking this year? “Focus on Inequality and Growth” reveals inequality is bad for economic growth. “The long-held belief that there was an automatic trickle-down effect of wealth has proven not to be true..”. The report advocates for ‘immediate redistributive’ policies focussed on the bottom 40% of the population. NZCCSS member agencies have long been the ambulance at the bottom. As Trevor McGlinchey says “It is good this report recognises the impacts of inequality on the bottom 40% of earners. Even families with close to mid-level incomes increasingly need to access food parcels, family counselling (due to the family stress brought about by not having enough income) and other services from our member Christian Social Services Agencies”. Here are some key points taken from the report. The countries with the biggest increases in income gaps are New Zealand, Finland, Israel, Sweden, and the United States. Rising inequality cost New Zealand economy more than 10% points of growth between 1990 and 2010. Governments should consider rejigging tax systems to make sure wealthier individuals pay their fair share. It suggested top rates of income tax, scrapping tax breaks that tend to benefit higher earners and reassessing the role of all forms of taxes on property and wealth. By hindering human capital accumulation income inequality undermines education opportunities for disadvantaged individuals, lowering social mobility and hampering skills development. 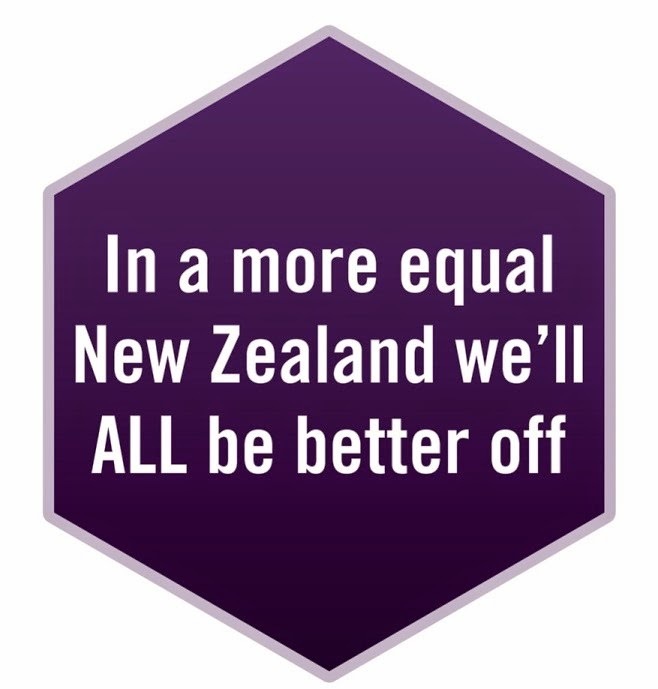 Lauren Baker’s report for Radio New Zealand includes comments from Bill Rosenberg who thinks “New Zealand may have lost far more than the OECD estimates. "The growth per person between 1990 and 2010 in New Zealand would have been almost 15 percent higher, and taken it to near the top of the OECD, if we hadn't had the huge increases in inequality over the period of about the mid-1980s to the 2000s." Max Rashbrook has written a blog on The Damage to New Zealand’s economy makes inequality hard to ignore. The latest Child Poverty Monitor has been released and despite much talking the data suggests New Zealand is still treading water on this issue. The report indicates child poverty has decreased from 27% to 24% but this is still a significantly high level of child poverty in a population of only 4 million people. Jean Simpson (Co-author of the report) gave an interview to Radio NZ, in which she expresses deep concerns about high rates of Sudden Unexpected Infant Death and of hospitalisation of children for preventable respiratory diseases and other infectious diseases. Dr Russell Wills, Children’s Commissioner, was also interviewed on the report in which he emphasised the need for government to develop a plan to reduce child poverty. Deborah Morris Travers, UNICEF NZ, says the report “reinforces the need for a relentless and coordinated effort to lift all children out of poverty. In particular, it calls for improvements to the incomes, housing and health of the roughly 110,000 (10 per cent) children living in severe poverty and material hardship. Hon Anne Tolley, Minister for Social Development indicates a child poverty package is in the wings for next year’s budget. Some positive news on the welfare reforms. The Ministry of Social Development’s procurement programme has seen lower costs for both the purchase of spectacles and whiteware. This is great news for people on low income who can apply for loans to purchase Fisher and Pykel whiteware and spectacles at a reduced rate. Find out more here. Hot of the press! CPAG has released a new report “The complexities of “relationship” in the welfare system and the consequences for children”. The report aims to kick start a national conversation about how to make the welfare system fit the 21 century. A key focus of the report is the use of marital status as the defining characteristic for benefit entitlement rather than what is best for the health and well-being of families/whanau. The document argues social welfare policies need to re-focus away from entitlement eligibility to what a sole parent and her children need to keep health and to flourish. This is a must read prior to the release of consultation documents on the pending The Social Security Act 1964 Rewrite. Put it on your Christmas reading list! Have Conditions At The Stable Improved? The Prime Minister’s Science Prize has been awarded to Professor Phillippa Howden-Chapman in recognition of her world-leading research on housing and health. Professor Howden-Chapman was also a member of the Expert Advisory Group (EAG) into Solutions to Child Poverty and contributed to the EAG Working Paper on Housing. 12 recommendations were made to government and all relevant. The New Health Minister Jonathan Coleman and Pacific Peoples Minister Peseta Sam Lotu-liga recently expressed support for a collection of short films made by students to help raise awareness about rheumatic fever. Not sure if the video includes a reference to the socio-economic causes of this preventable, third world disease? Congratulations to Nurse Managers at Presbyterian South Canterbury (PSSC) who were recently awarded for their work in aged care homes and looking after residents. PSSC won not one but two categories! The initiation of buffet meals received recognition in food services, and the introduction the Eden Alternative Philosophy to eliminate loneliness, helplessness and boredom won the innovation delivery award. The Salvation Army’s client base has increased by 4,000 in the last 3 months, up 12% on last year. 40,000 more Christmas presents are needed for distribution by the big man in red. A recent report identifies single men as a group likely to need help. Major Pam Waugh says single men now make up 20% of the Salvation Army's client base. These men are unemployed, unable to access housing benefits as easily as families, marginalised and sometimes have child support debt. Christmas Read At The Beach…….. The Economy of Life: An Invitation to Theological Reflection and Action is the result of World Council of Churches consultation. The document promotes expressions of koinonia (being in communion with God, all peoples and the whole of creation), and aspires to a world where “all people have a dignified, clean and safe place to live and die among family and friends who love and share life with them; where work has dignity and wages are fair and just.” This is an inspiring work and well worth a read! If you want more information check out the Privacy Commissioner John Edwards' recent speech to the Child Protection Special Interest Group (of the Pediatric Society of New Zealand) here. See here for the Escalation Ladder guidance for sharing information about vulnerable children referred to in the presentation. 23rd December 2013 to 14th January 2013.